These trees are custom orders for those in the *local area only (see below). The cost includes the consultation, agreed upon origami, and added ribbons or decorations. Finished trees are works of art and quite beautiful and unique. 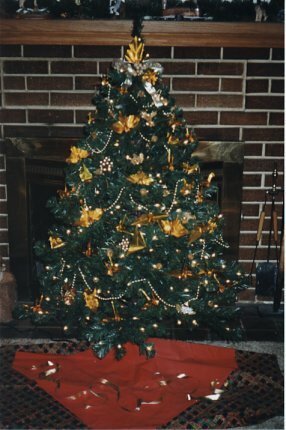 You choose to have *your natural tree or artificial tree decorated, as well as the colors. Please see sample photos on this page. 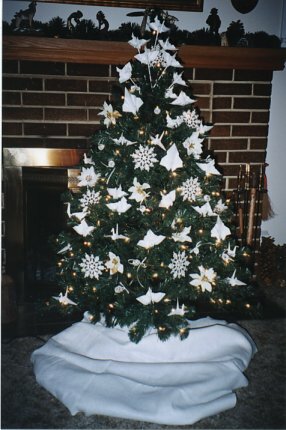 Call or email Origami Designs early as we can only do a limited number of trees during the month of December. 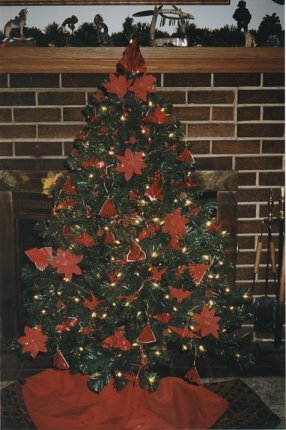 Below is the "Charlie-like- Brown Tree"... a small 3ft artificial tree, not much to look at until we added the miniature origami decorations. ORDER this tree for Christmas from our products page! This tree was prepared for a holiday episode of a prime time TV show. But simliar trees for parties, children's rooms, classrooms etc., are wonderful and can be shipped by order if ordered early enough! - Origami items are a mixture of cranes, ceremonial cranes, swans, peacocks, butterflies, fans, leaves, stars and other origami items. - These trees include if ordered: matching ribbon, small natural sprigs in corresponding colors, as decided in the consultation and order. 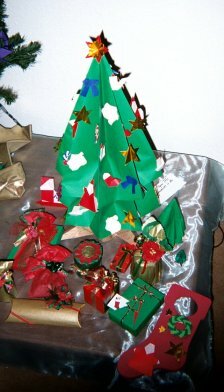 Origami Decorated Trees shown here are examples. These are 4 ft artificial noble fur trees. * Origami Designs will by special arrangement and agreement provide the tree for retail shops and galleries. This arrangement must be made by October 31 of the year. 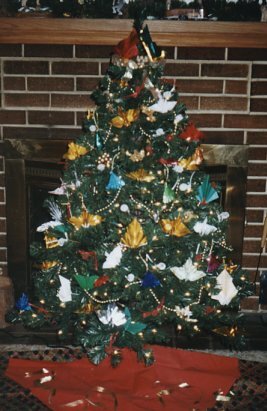 After a consultation with the client, your trees are then decorated with origami in your choice of color. Items include various cranes, butterflies, fans and origami balls, stars and other appropriate items. We will add your balls or other ornaments, beads, ribbons etc. as arranged or agreed upon, in the consultation and order. We want your tree to be special and to your desires and needs. I add flowers, natural glitter pinecones, sprigs, snowflakes, balls and other items in corresponding colors at your request or my discretion. The tree can be decorated as these or in a "wave pattern"
The "wave" is a concentration of origami cranes that starts at the top and winds its way down around the tree in a spiral wave to the bottom. Many of the white origami on the white tree, is sprinkled with white glitter and these trees are stunning in real life, and more so with lights on. .
Silver Foil decorated trees are very nice with glass or crystal balls or glass icicles or the silves icicles. 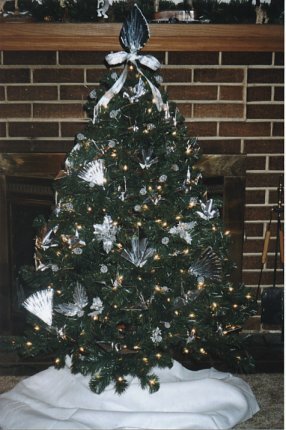 The photo does not show how very elegant the silver decorated origami tree really is. Both the silver and white origami look beautiful & unique snow frosted or white trees! * NEW! Special News for those nationwide who want to do an origami tree. Origami Designs will ship an assortment of folded items, ready to hang or attach to your tree by special order. Simply email us with your ideas, color selection and size of tree you will be decorating. We will send you by email a quote and shipping date information . 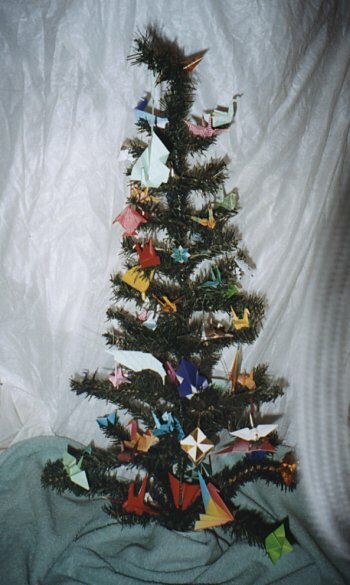 ANYHome can have a beautifully decorated Origami Christmas Tree! Above: 2004 ** Our newest addition is an All-Origami Tree for Christmas. All paper, all origami models for decoration: boots, stars, birds, santas, wreaths, and more! Small packages available by separate order.